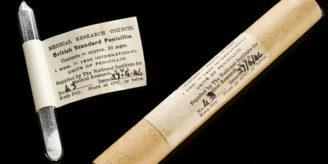 The summer of 2009 sees a wave of celebrations to mark the fourth centenary of Galileo’s first use of the telescope to observe celestial phenomena. In his birthplace Pisa, the exhibition Telescope and Paintbrush: New art and new knowledge in the age of Galileo opened at the Palazzo Blu on 9 May. The exhibition shows how the new discoveries arising from the telescope were adopted as themes by the painters, writers and musicians of his time; how Galileo himself was portrayed; the relationships between Galileo and collectors and connoisseurs; Galileo’s association with the Florentine painter Ludovico Cardi, called il Cigoli; and the European impact of Galileo’s Sidereus nuncius. The exhibition rescues from obscurity many little-known works, and includes a reconstruction of Galileo’s own collection of paintings at the time of his death. 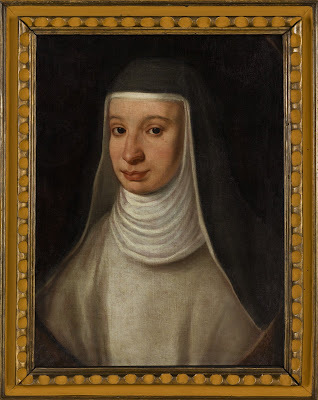 One of the loans from the Wellcome Library is the portrait traditionally identified as a painting of Galileo’s daughter Virginia (1600-1634) known under her religious name as Sister Maria Celeste: she was a nun of the order of the Poor Clares, and the comfort of Galileo’s old age. This could be one of the Wellcome Library’s most reproduced works, as it appears on the front cover of Dava Sobel’s international best-seller Galileo’s daughter (1999). Above: the portrait of “Galileo’s daughter”, Wellcome Library no. 45565i. Right: Dava Sobel with the portrait. Note that since Dava Sobel’s visit, the old frame has been cleaned of the later overpaint which obscured the indented running pattern. 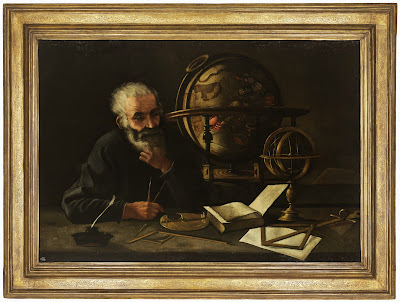 Visitors to Pisa will also see from the Wellcome Library this painting (below) of a philosopher with a celestial globe, one of several seventeenth-century Italian paintings of astronomical subjects inspired by Galileo’s growing fame. The painting, like some of the other Galileana in the Wellcome Library, was bought by Henry S. Wellcome from the private museum of Galileo personalia assembled by Count Paolo Galletti at the Torre del Gallo, near Florence, and is in a frame with a pattern found on several paintings with the same provenance.